David Roberts RA (24 October 1796 – 25 November 1864) was a Scottish painter. He is especially known for a prolific series of detailed lithograph prints of Egypt and the Near East that he produced from sketches he made during long tours of the region (1838–1840). These and his large oil paintings of similar subjects made him a prominent Orientalist painter. He was elected as a Royal Academician in 1841. The Great Sphinx (and) Pyramids of Girzeh (Giza) 17 July 1839, by David Roberts. 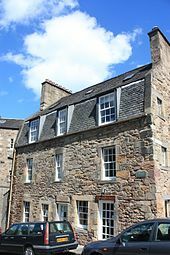 David Roberts was born at Duncan's Land (now 8 Gloucester Street), Stockbridge near Edinburgh, the son of John Roberts, a shoemaker, and Christian Richie. At the age of 10, he was apprenticed for seven years to a house painter and decorator named Gavin Beugo, his fellow apprentice being David Ramsay Hay, who became a lifelong friend. During this time he studied art in the evenings. After his apprenticeship was complete, Roberts's first paid job came in the summer 1815, when he moved to Perth to serve as foreman for the redecoration of Scone Palace. Roberts returned in the spring of 1816 and lived with his parents while looking for work. His next job was to paint scenery for James Bannister's circus on North College Street. This was the beginning of his career as a painter and designer of stage scenery. Bannister liked Roberts's set designs and on 10 April 1816 engaged him at a salary of 25 shillings per week to travel with the circus on a tour or England. Roberts departed Edinburgh with the circus later the same month and travelled to Carlisle, Newcastle, Hull and York, returning to Edinburgh in January 1817. During his time with the circus, Roberts was called on to take several minor stage roles as a foil for the clowns' skits. For the first few months of 1817, Roberts worked as the stage designer's assistant at the Pantheon Theatre, Edinburgh, a new joint venture between Bannister and an Italian musician named Corri. However the Pantheon was a financial failure and closed in May 1817, putting Roberts out of work. He reluctantly returned to house painting, working on the mansion house of Abercairny, near Perth, designed by Gillespie Graham. Although he was working from 5 a.m. to 7 p.m. he took the opportunity to sketch in the woods around the mansion in the evening. He followed this up with a stint painting imitation wood and marble at a mansion at Condie, near Bridge of Earn, in Perthshire. At the urging of his parents, Roberts returned to Edinburgh in January 1818, where he took employment with John Jackson, a decorative painter. Working for Jackson during 1818, Roberts decorated Lord Lauderdale's Dunbar House (known later as Lauderdale House) and then the library of Craigcrook Castle for Lord Jeffrey, who had recently leased the property. In 1818, the Pantheon Theatre reopened in Edinburgh. Initially, a company from London with their own scene painters was in residence, but after they left, Roberts was able to get work from Corri as a scene painter. While Corri offered Roberts the position on 25 July 1818, he was already committed to house-painting work for Jackson and was unable to start at the Pantheon until the winter season. As there was no separate painting room, Roberts had to paint sets directly on the stage, which was occupied by rehearsals during the day and performances in the evening. Therefore, Roberts generally began work after the evening production had finished, working through the night. Roberts's work was noticed by the stage-manager, Mr. Monro. After the Pantheon closed, Monro moved on to the Theatre Royal, Glasgow, where he arranged for Roberts to be hired as a principal scene-painter. In 1819, Roberts became the scene painter at the Theatre Royal in Edinburgh (having at this time James Ballantine as his apprentice). There Roberts met the Scottish actress Margaret McLachlan, said to be the illegitimate daughter of a Highland gypsy girl and a clan chief. They married in 1820, "for pure love". Although the marriage did not last long, it produced Roberts' only daughter, Christine, who was born 1821. Although he was making a living from scene painting, it was around this time that Roberts began to produce oil paintings seriously. In 1821 he became friends with the artist William Clarkson Stanfield, who joined him to paint scenery at the Theatre Royal, and Roberts developed his love of landscape painting. In 1821 the Fine Arts Institution of Edinburgh accepted three of Roberts's paintings – views of Melrose and Dryburgh abbeys – two of which sold. At Stanfield's suggestion, Roberts also sent three pictures to the 1822 Exhibition of Works by Living Artists, held in Edinburgh. The Holy Tree, Meterea Lithograph by Louis Haghe from an original by David Roberts. In 1822 the Coburg Theatre, now the Old Vic in London, offered Roberts a job as a scenic designer and stage painter. He sailed from Leith with his wife and their six-month-old Christine and settled in London. After working for a while at the Coburg Theatre, Roberts moved to the Theatre Royal, Drury Lane to create dioramas and panoramas with Stanfield. A miniature by Roberts from this time shows Margaret as a delicate woman with blonde ringlets, holding the smiling three-year-old Christine. But Roberts' family life was not as idyllic as this picture suggests: Margaret had become an alcoholic, and eventually, in 1831, Roberts sent her back to Scotland to be cared for by friends. Roberts may have burned some letters from this period in shame at his wife's drinking problem, but he was unusually frank in a letter to a friend, David Ramsay Hay. Roberts and Hay had been an apprentices together, and Hay had been seeing a mistress since his own wife had started drinking. "If you do not know our cases are almost parallel. Yours is not as bad as mine, having some consolation. The state of my nerves is such I can scarcely write. But thank God she leaves tomorrow—I hope for ever." 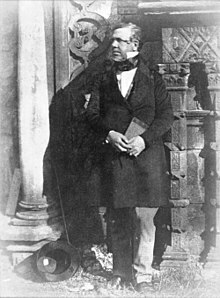 In 1824, he exhibited another view of Dryburgh Abbey at the British Institution and sent two works to the first exhibition of the newly formed Society of British Artists. In the autumn of 1824 he visited Normandy. His paintings based on this trip began to lay the foundation of his reputation; one of them, a view of Rouen Cathedral, sold for 80 guineas. While he built his reputation as a fine artist, Roberts's stage work had also been commercially successful. Commissions from Covent Garden included the sets for the London premiere of Mozart's Die Entführung aus dem Serail (The Abduction from the Seraglio) in 1827, scenery for a pantomime depicting the naval victory of Navarino, and two panoramas that he executed jointly with Stanfield. During the second part of the 1820s, and in addition to English and Scottish scenes, Roberts painted views of prominent buildings in France and the Low Countries including Amiens, Caen, Dieppe, Rouen, Antwerp, Brussels and Ghent, sometimes making several paintings of the same scene with only minor variations. By 1829 he was working full-time as a fine artist. That year, he exhibited the Departure of the Israelites from Egypt, in which his style first became apparent. In 1831, the Society of British Artists elected him as their president. In 1832 he travelled in Spain and Tangiers. He returned at the end of 1833 with a supply of sketches that he elaborated into attractive and popular paintings. The British Institution exhibited his Interior of Seville Cathedral in 1834, and he sold it for £300. He executed a fine series of Spanish illustrations for the Landscape Annual of 1836. Then in 1837 a selection of his Picturesque Sketches in Spain was reproduced by lithography. In London he made the acquaintance of artists such as Edward Thomas Daniell and John Linnell, who frequented Daniel's house. J. M. W. Turner persuaded Roberts to abandon scene painting and devote himself to becoming a full-time artist. Roberts set sail for Egypt on 31 August 1838, a few years after Owen Jones. His intent was to produce drawings that he could later use as the basis for the paintings and lithographs to sell to the public. Egypt was much in vogue at this time, and travellers, collectors and lovers of antiquities were keen to buy works inspired by the East or depicting the great monuments of ancient Egypt. Roberts made a long tour in Egypt, Nubia, the Sinai, the Holy Land, Jordan and Lebanon. Throughout, he produced a vast collection of drawings and watercolour sketches. Muhammad Ali Pasha received Roberts in Alexandria on 16 May 1839, shortly before his return to the UK. He later reproduced this scene, apparently from memory, in Volume 3 of Egypt & Nubia. David Roberts Esq. in the Dress He Wore in Palestine, by Robert Scott Lauder. (1840). Upon Roberts's return to Edinburgh in 1840, his fellow-artist, Robert Scott Lauder, painted his portrait. (In 1980, the National Gallery of Scotland purchased the portrait.) Scottish society fêted him. For instance, he was the guest of honour at a dinner on 19 October 1842, at which Lord Cockburn presided. On his return to Britain, Roberts worked with lithographer Louis Haghe from 1842 to 1849 to produce the lavishly illustrated plates of the Sketches in the Holy Land and Syria, 1842–1849 and Egypt & Nubia series. He funded the work through advance subscriptions which he solicited directly. The scenery and monuments of Egypt and Holy Land were fashionable but had hitherto been hardly touched by British artists, and so Roberts quickly accumulated 400 subscription commitments, with Queen Victoria being subscriber No. 1. Her complete set is still in the Royal Collection. The timing of publication just before photographs of the sites became available proved fortuitous. Edinburgh from the Calton Hill, 1858. In 1851, and again in 1853, Roberts visited Italy, painting the Ducal Palace, Venice, bought by Lord Londesborough, the Interior of the Basilica of St Peters, Rome, Christmas Day, 1853, and Rome from the Convent of St Onofrio, presented to the Royal Scottish Academy. His last volume of illustrations, Italy, Classical, Historical and Picturesque, was published in 1859. He also executed, by command of Queen Victoria, a picture of the opening of the Great Exhibition of 1851. In. 1839 he was elected an associate and in 1841 a full member of the Royal Academy; and in 1858 he was presented with the freedom of the city of Edinburgh. The last years of his life were occupied with a series of views of London from the Thames. He had executed six of these, and was at work upon a picture of St Paul's Cathedral as seen from Ludgate Hill, when he died suddenly. He collapsed on Berners Street on the afternoon of 25 November 1864 and died at home that evening. The symptoms, described as apoplexy in most histories, were those of a stroke. He was buried at West Norwood Cemetery. Roberts, David, Record Book, 1829–1864, unpublished manuscript, Yale Center for British Art, New Haven. Roberts, David, Eastern Journal, 1838–1839, unpublished manuscript, National Library of Scotland, Edinburgh. Church of the Holy Sepulchre Jerusalem Lithograph by Louis Haghe from an original by David Roberts. Edinburgh from the Calton Hill (1858). Oil on canvas. Approach of the Simoom--Desert of Gizeh Lithograph by Louis Haghe from an original by David Roberts. Obelisk at Alexandria Commonly Called Cleopatra's Needle Lithograph by Louis Haghe from an original by David Roberts. The Hypaethral Temple at Philae called the Bed of Pharoah Lithograph by Louis Haghe from an original by David Roberts. Departure of the Israelites (1829). Oil on canvas. Thebes Decr 4th 1838 Lithograph by Louis Haghe from an original by David Roberts. Convent of St Saba 4 April 1839 Lithograph by Louis Haghe from an original by David Roberts. ^ a b c d Grant 1880, p. 78. ^ a b Mansfield 2006. ^ a b c Ballantine 1866, p. 7. ^ Ballantine 1866, p. 8. ^ a b Ballantine 1866, pp. 8–10. ^ Caledonian Mercury & 23 January 1817, p. 1. ^ a b Ballantine 1866, pp. 10–11. ^ a b c Ballantine 1866, p. 11. ^ Caledonian Mercury & 27 August 1818, p. 3. ^ Ballantine 1866, pp. 11–13. ^ Ballantine 1866, pp. 13–14. Chisholm, Hugh, ed. (1911). "Roberts, David" . Encyclopædia Britannica. 23 (11th ed.). Cambridge University Press. p. 403. ^ a b Mansfield 2007. ^ Ballantine 1866, pp. 24–40. ^ Gilbert 1901, p. 112. ^ Roberts, David "The Page of the Dead"
^ "Culture.gov.uk". Gac.culture.gov.uk. Retrieved 23 May 2012. ^ "Lot 74: David Roberts, R.A (Scottish, 1796–1864) – Christie's". Artfact. Archived from the original on 6 February 2012. Retrieved 23 May 2012. Lee, Sidney, ed. (1896). "Roberts, David (1796-1864)" . Dictionary of National Biography. 48. London: Smith, Elder & Co.
Wikimedia Commons has media related to David Roberts.